This page documents various techniques for the CNC milling machine plus resources (like Haas Tip of the Day) you can use to become a Better CNC’er. . It’s a grab bag of tips and techniques that didn’t have a home in one of our Cookbook Mega Guides. I want to start with one of the best resources out on the web for CNC’ers that I’ve discovered, and that’s the Haas Tip of the Day. 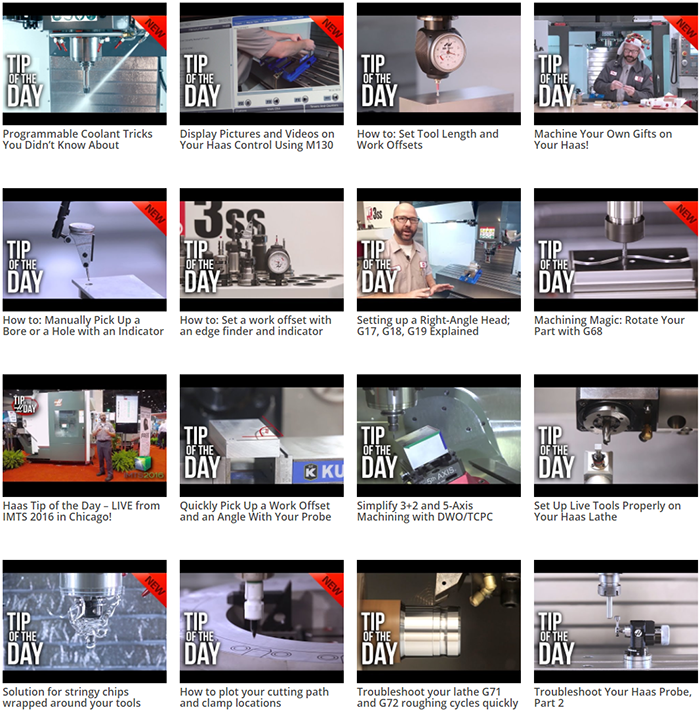 Haas Tip of the Day is a video channel on YouTube that’s filled with great nuggets of CNC goodness. First and foremost, if you have a probe and the right macros or control panel features to make it sing, use a probe to locate a feature that is round. Nothing beats them for accuracy and speed. Picture that long feeler as being sort of like a very exagerated finger from a dial test indicator. It goes against the inside of the hole, or there are curved feelers for the outside of a round boss. You turn on the spindle at the lowest rpm, say 100rpm, and hold the horizontal rod. This keeps the indicator facing your way while the feeler sweeps around the circumference of the feature you want to center on. As the feeler sweeps around, the needle will “kick” because the spindle axis is not centered. Now adjust the X and Y axis (via jogging in CNC and handwheels on a manual mill) until the needle kicks as little as possible. That’s all there is to it, you are done very quickly. Adjust the axes one at a time and don’t even think much about what’s needed. Simply turn the wheel and observe whether the needle kicks more or less. Turn it in the direction that kicks less. When you’ve minimized the kick on one axis, do the other. I circle back a second time around and got to almost no kick at all. 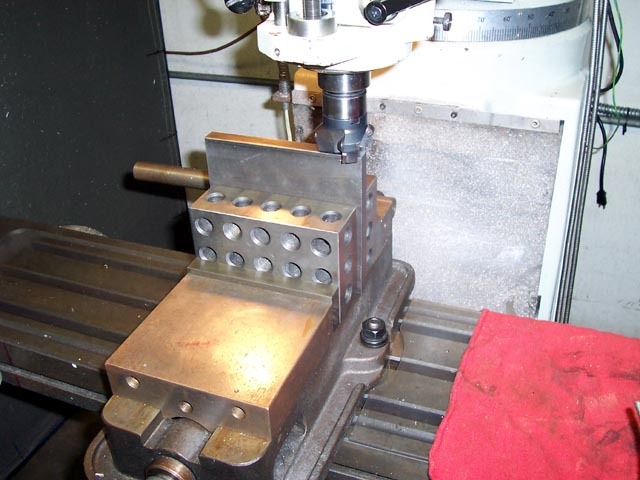 Make sure your mill is trammed in properly before attempting any accuracy drilling or boring! -lock table & saddle gibs as suggested…noting any change in the DRO readings and compensating appropriately. On the center drill, if you use one, and I understand why, they are short, rigid, and common in the shop, so only use it to SPOT, then it is a 118 degree spotter, all is good, don’t drill deeper than the drill point, and surely don’t drill deep enough to actually start to get a center. I elarned how bad this is for the following drill in harder materials, the tips of the flutes start cutting first and get chipped, it cannot be good for the drill in softer material either is my thinking. It comes to mind your mill may have some “lost motion” somewhere, so with a good indicator you can dial in, and come back to 0 on the DRO from differant directions and see what ends up happening. Also I have never seen this, BUT your quill travel may not be square to the spindle bearings, I cannot imagine how that could happen on a good machine, but you can check for it. It sounds to me like you are getting a reasonable result for drilled holes. Use a new centre drill and a new, good quality, drill. Make sure you ease the centre drill in, using high revs, cutting oil and clear often. Same with the drill, slow down to correct speed, cutting oil, clear often. Don’t use re-sharpened drills on a job like this, keep yourself a good set for jobs like this. I disagree with the idea of only dimpling with a centre drill. Make a decent centre in my experience. Maybe you need to start thinking about boring your holes if you want exact locations, but this will slow you down a lot, single point cutting is a another (harder) skill to learn! As to making a “good center” with the center drill, trying that in some 4140 HT or even harder stuff will illustrate the condition that learned me to NOT do that, actually a 120 degree spotting drill is better anyway but not as commonly avail within arms reach in the shop. if a hard material chips off the drill tips when running a 118 drill into a 60 degree center, I have to think the same process occurs with softer material, but is not as apparent because it is not as extreme. If you watch, feel, and listen to a drill you can tell it is unhappy when starting (sounds japanese eh) but it gets very happy when fully engaged and doing the job it was made to do, a 120 spotter gets it to the happy place quicker 🙂 I agree “spark out” of the drill with the quill against the depth stop (or a short G04 in cnc)helps get a better location, it gives any spring in the machine and setup a chance to work itself out. I never want to seem to cut down anothers experience, their method may sure add quality to MY work if I apply it, and I think the key is finding the WHY in the process that makes great parts, sometimes it is not truly a result of the intent of the guy that found it but it cannot be denied that it works. I also wanted to add that adding a “boring” step to the process with an endmill in a collet can truly make for better positions, honestly if the endmill is only taking out a little per side it may be truly as accurate as single point boring, and a following drill or reamer will follow very close to that established position. The drill generally “wants” to go straight and starting it off that way helps it do that…they can and do wander as depth increases, but if they are started off position they cannot help but walk like mad. If you have runout, consider the following. If you have an ER collet you can tap the tool in. Measure, find the high spot and keep taping it until it gets runs true. Works with collet holders but not usually EM holders. We do it at work all the time seeing as harldy any of our machines run true. They all need new spindles as far as runout is concerned. Good tapers, bad bearings, usually. one of our machines runs dead nuts untill you clamp a tool in the spindle and put tension on the bearings… Then it is out .0015 at 6 inches from the face, which with PCD Reamers is not acceptable. Here we go again guys. 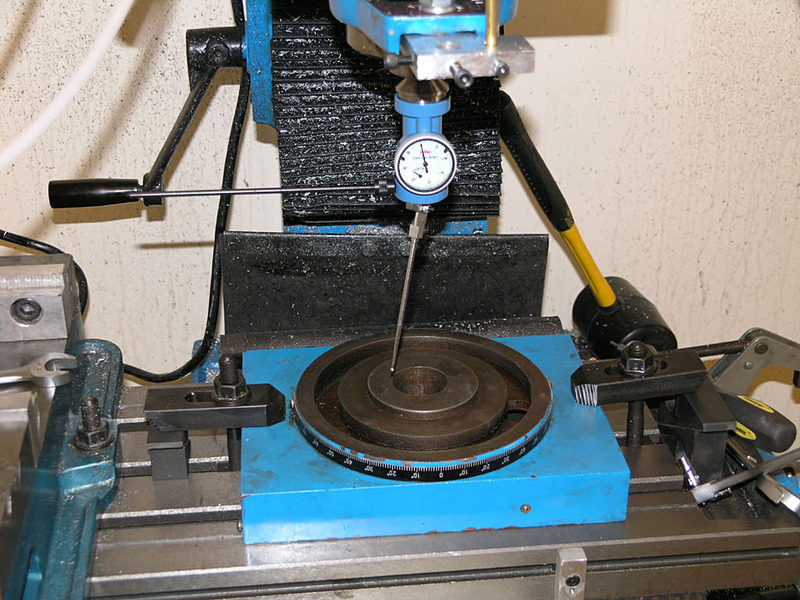 From the men at Spindle Grinding Service…..Check the taper. Not only for runout, but use some Dykem 107 high spot blue on the holder and clamp it in to check contact. If the taper is worn it will cause runout in your holder. That would be my very first check. Something tells me that is the problem. Could possibly be drawbar pressure, but the taper would be my first guess. Whenever we get an oversized dowel pin hole we get out the ball bearings. Stick one in the offending hole and give it a tap with a hammer. Now the pin will hold securely, and as long as the hole location was correct before it should work for you now. I’ve had to do this more times than I care to recall. Now this is for in-house tooling. I don’t think I could sell this to anyone if they saw me doing it. With the pin in it though, you can’t even tell. Also, with reamers the top portion of the shank is annealed, and will “float” into the hole without boring it. If you hold it below the anneal you will end up with a very inaccurate boring bar. We do a lot of dowel pin holes, up to 1/2″. We have had good luck by spot drilling, drilling about .030″ undersize, boring with a 2 flute end mill that is .015″ under, & then reaming. The endmill is chamfered about .030″ x 45 deg, & most of the flutes are ground off, leaving about 1/8″ of full diameter at the front. We use from .006″ to .012″ IPR feed. Using the endmill gives a quick & dirty way to get true position & the reamer will follow the hole. This process is not as good as boring for true position but is pretty close & a lot faster. Sometimes to repair a loose dowel hole, I will tap it with the same size form tap, i.e. 1/4-20 form tap for a 1/4″ dowel. The tap will raise ridges to tighten the hole and with a little loctite, I am done. We also made an alignment block, just like a tapping block, with about .002″ clearance for the dowels. It makes dowel installation easy. Reduce the flex in deep holes on a 2 flute cutter by grinding down one flute. Now the cutter acts like a boring bar. Interpolate the hole with the largest endmill that fits (to reduce flex) and leave a small amount for a finish pass with a reamer. Adjust your interpolation feedrates to increase accuracy by reducing acceleration. If you’re getting long stringy chips, you’re going too slowly. Turn up the spindle speed. Prefer feed speed to spindle speed wherever you can. Stainless steel work hardens, so turn the spindle slower and use a lot of pressure on the feed. You have to cut through quickly before it can work harden. Most say the extra cost of cobalt bits isn’t worth it except for very special cases. Any hole more than 4x the diameter of the drill is a deep hole and needs care to be taken to succeed. Check out our Deep Hole Drilling Guide for tons of tips and techniques to help. Tip: Coolant will increase the range of optimal speed. In other words, it lowers the speed where things work best as well as raising it, creating a broader “sweet spot” of speeds that is easier to hit. The ability to lower rpms more smoothly is something many miss, thinking coolant is only about raising the limits. Tip: The lubricating effect of coolant can improve surface finish by making it less likely chips will scratch the workpiece. This is particularly important in soft optical materials like plastics. Tip: While we’re talking about reducing scratching via chips, use cutters with more chip clearance with soft materials to improve surface finish. You can do this by reducing the number of flutes. A single flute cutter gives a much nicer finish on plastic, for eample. Tip: Cutting oil will reduce chatter. Chatter is just a harmonic resonance, so anything you do to change the “tuning” of the instrument can reduce the chatter. Heavy cutting oil provides a little damping of that resonance. Accurate Z-Axis Adjustment on the Mill: How Far Off Are the Different Techniques? I believe that one has to allocate time to experimentation to learn the really good stuff, so I resolved to experiment with z-axis accuracy, and along the way, dug out a purchase I had almost forgotten to test. In the end, I tried four different methods. 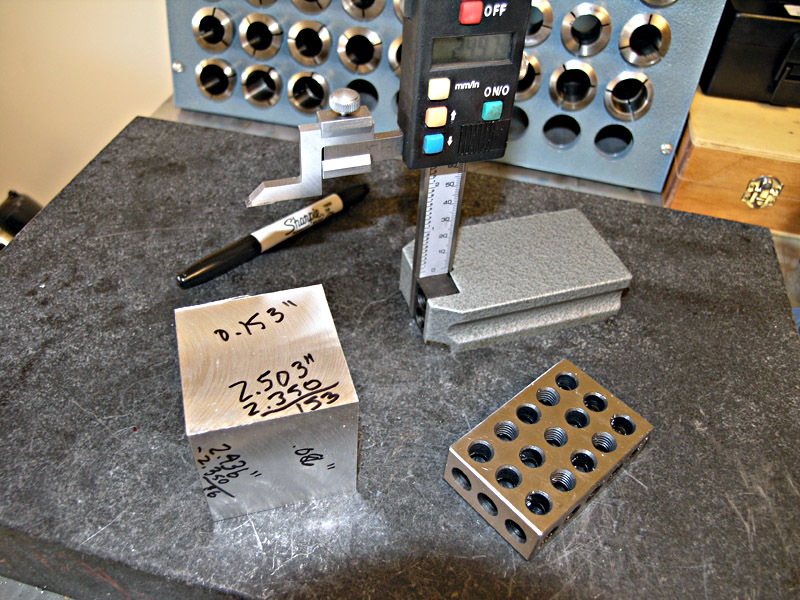 In each case I used my surface plate and digital height gage to determine how closely I had come. Touch off by feel: For my 1st Method, with the spindle stopped, clunk down the cutter onto the top of the workpiece. Zero the DRO and go from there. This produced a result with an error of 0.012″. Not very good! The error was relatively repeatable, so one could add the fudge factor. In the end of the day, the cut was 0.012″ deeper than desired. Touch off by sound: For my 2nd try, I gently lower the spindle under power and listen for when the cutter started to cut. This method proved slightly more accuate, and resulted in 0.0085″ too deep a cut. Still not very good. Touch off with paper: The traditional old school method involves holding a piece of cigarette paper (rumored to be exactly 0.001″ thick) on the workpiece and gradually lowering the cutter until it starts to catch the paper. Add another 0.001″ and you are at zero! Not having any cigarette papers, I used standard laser printer paper. I cut a 1/2″ wide strip so I could hold onto one end from a safe distance, and waited for the cutter to grab. In my case, I got a grab at 0.010″, not 0.001″, but at least it was a nice round number and pretty repeatable. Z-axis Presetter: At this point, I thought I was done and would be using the good old paper trick. But I had a vague recollection that finally came back to me. Did you ever by a gadget that looked like a good idea, but before it ever arrived you started doubting it would work well, stuck it up on a shelf, and never actually tried it? How does it work? Simple. There is a little knurled knob visible on the bottom left. It has a “test” and a “use” position. Set it to “test” and an internal standard swings into place so that if you press the anvil on top with your finger until you hit the stop, you’ll have exactly 2″ from top of anvil to bottom of gadget. You rotate the dial to zero in that position. Now reset the knob to “use”, place it atop the workpiece, bring the cutter down until the needle registers, zero the needle, zero your DRO, and you should be exactly 2″ above whatever the presetter is sitting on. So, not expecting much, I plunked the sucker down atop my aluminum cube in my Kurt vise on the mill, cranked the head until the cutter almost touched. Locked the head and cranked the quill with the fine adjust until the needle zeroed, zeroed my DRO, removed the presetter, cranked down another 2″ with the fine adjust, zeroed the DRO again, added 0.010″ for a modest cut, ran the cube through under power feed, and hauled the block over to the surface plate to see what I had done. The desired result was 2.396″. I brought the height gage down to take a reading which was, drumroll please, 2.396″!!!! Holy uncanny accuracy, Batman! The silly presetter actually worked, and it worked well, and even though the quill travelled 2″, and I expected the worst, it came out deadly accurate! Hooray for the gadget that actually worked. I guess I’ll be using the silly thing more often. At $39, it was worth it! I had tons of 1-2-3 blocks hanging around, but this tip got me to buy a set of 2-4-6 blocks. 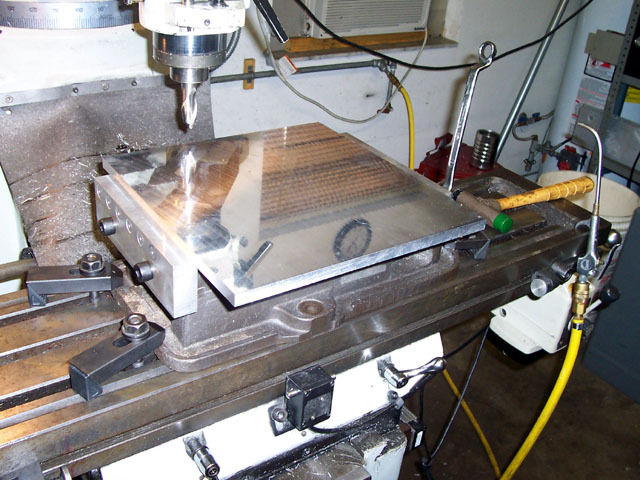 A good place to get started is 2D CNC programming with a mill. In this mode, you manually control Z, and just run the program in X and Y. You’ll have to write your program with that in mind, but the idea is to see whether you can get your machine to draw a circle in a particular place without going off track. You can put the Sharpie into your keyless chuck (you do have a keyless chuck, right? <G>) and jog it down until it makes contact with a sheet of paper taped down on a flat surface. Jog to the point you want to use as your Work Zero, and go from there. Experiment with your machine and program until you can draw a circle or other simple shape exactly where you want it. Move on to something more complex. The Mach 3 gang likes to use a g-code program that draws a roadrunner, so check their site for that. To test my recent build of a Shapeoko CNC Router, I just cable tied a Sharpie to the spindle. Once you have 2D programming down, you’ll be ready to tackle 3D. BTW, more than one CNC mill project built the X and Y axes with manual machining and then used this 2D technique to build the Z-Axis parts under CNC control. Not a bad way to bootstrap! A fly cutter will often produce the best surface finish because they allow you to finish a very wide area in one pass with no overlap marks. They make a distinctive sound as their single cutting edge makes its cut on the workpiece. It’s a noise that drives some machinist’s crazy and can best be characterized as a loud thumping (often called “hammering”) that sounds like its about to tear itself apart. You can easily convert a facemill to a flycutter by removing all but one insert, and it is interesting to experiment with the results. Reducing the number of inserts will necessitate a reduction in feedrate, but it may be worth it in terms of improved surface finish. For more than you ever wanted to know about Flycutters, check out our Ultimate Flycutter Guide. Mount an indicator in a drill chuck, bearing on the fixed jaw of the vise. Traverse the table (X axis) back and forth, and adjust the vise position until you get the same reading at both ends of the fixed jaw. Given that you have a swivel base, there’s a shortcut to get you close: Take a reading at the center of the jaw, then at one end. Calculate the difference between the two readings. With the indicator still at the end position, rotate the vise to remove HALF of the difference. Several cautions: 1) Make sure the indicator arm is actually moving. I’ve seen people do this with the arm hard against the stop, and think they have the vise adjusted perfectly 2) If the jaw is mounted with two screws, take a reading directly above each mounting screw and use these to determine whether the vise is square. The pressure of the mounting screws can distort the jaw. If the jaw was ever mounted with any dirt or contamination underneath, it can be permanently distorted, even if the obstruction was later removed. 3) Make sure the fixed jaw is straight in the first place. As noted above, it can be bent by the pressure of the mounting screws. This may be a bigger challenge than squaring the vise on the mill. Quick and dirty… clamp a dowel or other piece of bar stock in the spindle. Tighten one side of the vise pretty well and leave the other just barely snug. Just make contact with dowel on the face of the fixed jaw at the tight end of the vise. Move loose end to where it is definitely a bit out of line. Crank table under spindle with dowel in contact with the fixed jaw. When you have gone the entire length of the jaw, come back and make one more pass for insurance. NOW break out your DI and tweak it if you don’t like what you see. I did this today for a quick setup. When I put the DI in to check, I had less than .0005 in 4″ on the vise jaws. Close enough for what I was doing by far. Same deal with a horizontal, but grab a fairly large diam slotting cutter very lightly with the vise. Tighten the bolts. Put a DI on it now. If the vise jaws need to be parallel to the arbor, you might be able to come up enough to grab the arbor the same way. If not, do it the hard way. To get the fixed jaw close, I’ll use either a drill bit or a dowel pin in a drill chuck. Set a gap by eye at one end, duplicate it as best as possible at the other end. Once you get it where you can barely tell the difference by eye it’s time for the indicator. Saves being way off and having the test indicator needle spinning wildly and forgetting which way is which. Some vises move only a tiny amount from loose to tight – my Kurt changes less than .010, with the table bolts pulled forward. Others move at least one time zone. With those, as Bob said, snugging the bolts and making final adjustments with a hammer is the easiest way. An 8 oz ball-pein is a good size, small enough that you won’t damage the vise. If you vise is newer, or has newer jaw plates, indicate directly from the fixed jaw. If the jaws are well used & look like the surface of the moon, a tall parallel (clamped in the vise) gives the indicator a nice surface to contact. Last but not least, in Secrets of a Machine Shop, the author mentions that you can eyeball to within 0.002″ by putting a piece of long stock in the vise such that you can eyeball the visual gap between the stock and the table’s edge. This assumes that edge is actually parallel to the table’s motion–something to be checked on an Asian import! You could also use a steel rule. One fellow starts out with the rule in the vise, eyeballing the gap. He claims his accuracy with the rule is 0.010″, which is a good place to start with an indicator. Do you hate tramming vises? Well, it’s not that hard and you should be used to it by now, but there are faster ways. A note about gibbs. On column mills, the gibbs affect the tram of the head. If you like to tighten or lock them every time you perform an operation, you will limit the accuracy of your head tram. Better to adjust them fairly tight perhaps 4 times a year, tram after the adjustment, and then leave the gibbs alone if best accuracy is desired. Tramming your mill to a “thou or two” may not be good enough. If you move your table to a different spot to drill than where you indicated your part at you get projected error. also, try a test indicator in an indicol rather than your co-ax it will tell you if your co-ax is cheesy or not. I recommend Interapid. Use a singlepoint test indicator…the coax relies on a mechanism and precision alignments and fits therein. I am a fan of Interapid’s offerings in that category. Do yourself a favor, spoil yourself and buy an interrapid incicator, I bought a .0005 and aquired a .0001 over 20 years ago, the .005 has been repaired once, otherwise they have served me faithfully ever since, their only downside most of us machinests never see is they are effected by strong magnets, so guys that only grind don’t use them…turning on a 6″ permag chuck will damp .0003 tir out of an interrapid…didnt belive it until I was shown it by a man with far more experience ID grinding than me. Other than that hands down they are the nicest deal going, a guy turned me onto them back in 1984, so I guess it has been 22 years…I was 19 then hehe, 41 now, still on that same indicator. Never move the knee after picking up location. Learn to tram head dead nuts on a 6″ circle. When the head is not trammed dead nuts and you move the knee, the location changes. If you are out .004 on a 6″ circle, and you move the knee 3″ after removing your co-ax, you are now off .001 on location. In addition to the Interapid, get an Indicol that will attach to the spindle with a tool in place. This will allow you to use your indicator at any time. The easier it is to use, the more often you will use it. Also, get a couple of small mirrors to read the dial when its facing the column. Sticking your neck around back gets old very fast. I did not think about the knee changing the position of the tram, however, I was aware that the quill would throw you off, for example, if you tram the head with the quill retracted, and make your cuts with the quill extended several inches. It just magnifies your tram error, correct? The reverse also works, if you tram your mill with the quill fully extended, then the accuracy is higher when retracted. Tram your head over the largest circle you can swing (ie the width of the table). 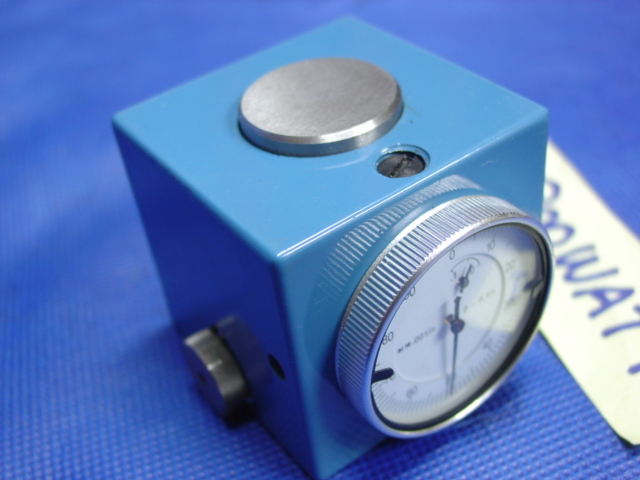 Use a dial or finger indicator and read directly on the table surface. No blocks, rings or anything else required, all will introduce error. Personally I tram the head without locking the knee, because I almost never use the knee lock at any time for the work I do. Centre you workpiece with a finger type indicator of some sort, the result will be right, whereas it sounds like the Coaxial type are not always trustworthy. You can even use a plunger-type indicator if that is all you have, and if you have enough room. The magnetic base will stick to your drill chuck and away you go. Sounds clumsy (it is) but use what you have. I don’t take much notice of the suggestions about not moving the knee, sometimes you have to. Try not to, ie plan ahead. I once had a guy working for me that had a Blake Co-ax. He scrapped quite a few parts before I made him stop using it. Unless the quill is in perfect tram, you are changing the center location, if you move the knee up or down, after you indicate the center of the workpiece. Error can be even more, if there is any wear or play in the knee gibs. One more thing to try: put a cylindrical square on the table, and use an indicator to check whether the z axis is parallel to the square’s axis. It could easily be that your z axis ways have excessive wear and its time to rebuild. It’s VERY IMPORTANT to always lock the vertical travel of the knee before you do anything, whether it’s taking a measurement or making a cut. With the knee loose, it will pull away from the column, but the magnitude and direction of the movement are unpredictable. Whenever you unlock the knee, its final position depends on the amount of weight on the table and the location of the center of gravity. But the center of gravity changes every time you move the table on either axis. 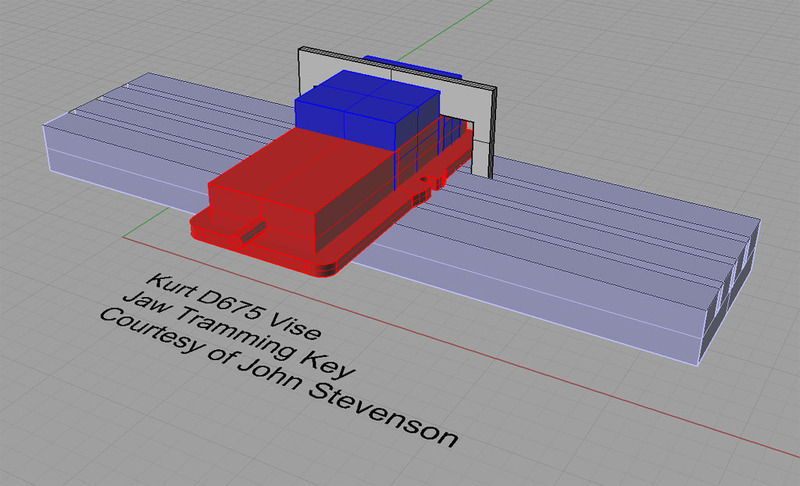 You first position the Z axis as required, then lock the vertical travel, then do whatever else you need to do. On assuming your tram is goodt. We re-indicate the tram every morning, before every fresh setup, after heavy milling, after a suspicious measurement, and of course, after a crash(tho’that’s never happened to me ). In mold work it is imperative as you usually doing onesy work and weld is so detrimental to the life of tool. After a week of indicating the whole shop in it is quite second nature and takes little time. As for the rig to indicate with we always called this a “tram bar”. I find indicol’s and those silly Co-ax indicators a waste of money. I made this bar by tracing off my mentor, he traced his off of his mentor and who knows where the pattern started. In this part of the country this type tram bar is common in many mold shops and other shops. It is a simple project and was the first tool I made when I took up mold making. It is simply CRS c&h with an ejector pin (drill rod will work) for a post, all thread for the screw, the universal sleeve is from Starrett, and then a ball swivel from Starrett or B&S. I welded an extension to the swivel. This rig will tram all the diameters and squares you will see. If needed a second snug and rod can be added to extend range. This will clamp down and bite hard and not wiggle or droop (a problem with the half baked Indicol with the nylon friction washers. Do yourself a favor and whittle out one of these and you’ll never have any issue with mystery location and flyer holes. well i have to make a coment or two here. first i stone the table to remove any burrs then i use a 1″ gauge block under the indicator so i dont worry about the indicator jarring or moving due to jumping over the T-slots. second in reference to the Blake coax use. these indicators are so quick to use for an initial location it amazes me anyone would not want to use one. but having said that i always go back and tweek the last few thou with at least a .0005″ indicator but usually with a .0001″ indicator, after all if your within .005″ or less it just takes a few seconds to be dead nuts.